How Can I Safely Tighten My Skin Without Surgery? Aging of the skin often first becomes apparent in the face and neck. In these highly visible areas sun damage, loss of collagen, and volume loss cause the skin to become loose and to sag. Most of us wish for tighter, younger looking skin as we age, but surgical alternatives such as facelift can be invasive and can involve extensive downtime. At the Langdon Center, we offer two procedures that safely tighten the skin without surgery. 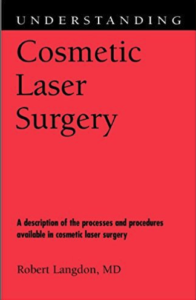 The Precision TX Laser uses fiber optic laser energy delivered through small skin incisions to liquefy fat cells and heat the skin and connective tissue. This causes collagen to contract and tighten, resulting in a more contoured neck, lower cheeks, and jawline. Treatment takes less than two hours and results last 5 to 10 years. There is minimal downtime or scarring after a Precision TX Laser Facelift. Tighten skin on the neck and lower face. Smooth the appearance of line and wrinkles. Create a more defined jawline and reduce jowls. Make you look and feel years younger! Enhanced Active FX is a one-step treatment. 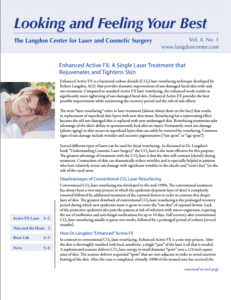 A sophisticated scanner delivers CO2 laser energy in small diameter “spots” all over the skin of the face. The deep layers of the skin are heated and collagen fibers will immediately shrink, providing significant contraction of wrinkled, sun-damaged skin. The result is smoothing of wrinkles, a feature especially evident in facial areas with “looser” skin, including the cheeks and around the eyes. Virtually all age spots on the face can be eliminated with a single Enhanced Active FX treatment. The protective epidermis layer will peel off within two or three days, revealing fresh, new skin. This fresh skin will be much smoother. Because most age spots are confined to the old epidermis, they will peel off along with the treated epidermis. The main difference between Enhanced ActiveFX treatment and conventional Active FX is that the energy is delivered at a faster rate, thus producing greater heat. As a result, the skin contracts even more, leading to greater skin-tightening results. If you have significant sun damage with facial wrinkles, loose skin, and age spots, please call our office to schedule a consultation with Dr. Langdon. Precision TX Laser Facelift or Enhanced Active FX may be a great option for you.